People have been emailing me all day about this video holiday card, which is pretty impressive considering it's ultimately an ad for the dad's new website which is about (get this!) creating viral videos. Well played, new website, well played. Ad aside, it's got everything most holiday cards have— cute kids, humble brags and big year end announcements ("Im quitting my job to start a viral video website! 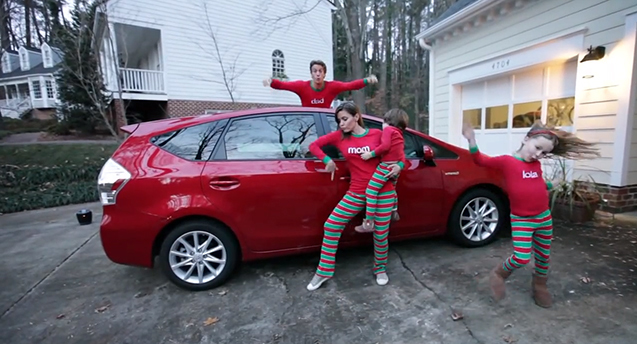 "), all done in adorably coordinated Xmas Jammies. In addition to going viral about their ability to go viral, their humble brags are legitimately impressive. They run triathalons! They interview the governor! They have speaking roles in Iron Man Three! What the hell are you going to write about in your holiday card? How you finished a whole jar of Nutella in one night? the problem is that humblebrags contain humble. Those are three minutes of my life I’ll never get back. There is nothing humble or charming about those people. Of course the bonus is, I’m pretty sure most people don’t want to smack me (although that could just be a delusion). Well I enjoyed it! My list would probably be me moaning about what we had to deal with. Broken leg on 2 yo = 8 weeks in a full body cast! Un-diagnosed placenta previa almost killed us! Whoot whoot! Making it out of 2013 with all 4 of us in our singular pieces! I think it’s cute, fun and merry. I didn’t want to like this but they are an adorable family. If I did half of that I’d be making a viral video myself. That should qualify you for Saint-hood. I think I would hang on to my husbands legs crying. The family is obviously already in the media as dad is an anchorman, so I’m sure people are used to seeing him. I thought it was cute and hysterical. Good for the family for getting kids involved in being silly and I would make a brag video too if my life was as cool as theirs! I don’t know, I thought it was a little funny. I mean, he talked about having a vasectomy on a viral video. he’s got balls. when I saw multiple links to this, I thought ‘oh, jeeze, is this what the masses are going to start doing now?’ cause I’m not, it’s hard enough getting cards out. I was glad to find out that this is their job (sorta). my only complaint is that I had that dumb song in my head all yesterday afternoon . I kind of loved it. Am i weird? I thought it was cute. The family is adorable and it seemed like they had lots of fun making it. How cute & fun. They seem like a fun loving family & it’s all very tongue in cheek. Not terribly humble. But entertaining.